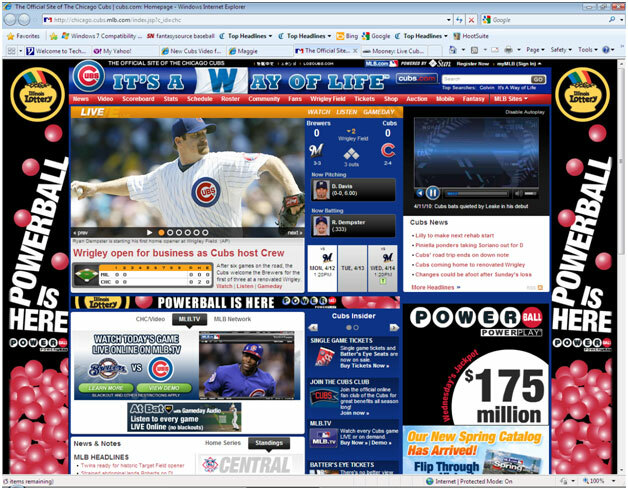 Home » biz of baseball » Cubs.com or Powerball.com? I went to Cubs.com, the official website of the Chicago Cubs yesterday and was surprised by the page that loaded. Gone was the Cubs-branded backgound, replaced by the Illinois Lottery‘s Powerball game advertising. What is up with THAT? I mean, sponsorship is a necessary element of MLB and of course the Ricketts family are certainly exploring every opportunity to generate new revenue streams for the club. I suspect, however, that this crass display of over-the-top, in your face marketing was more a product of MLB Advanced Media – the folks who run the official websites of all the major league clubs. There is no disputing the current revolution in marketing taking place, moving from traditional print and broadcast to complex digital marketing strategies involving more passive social media platforms and techniques. But this online display of commercialism on an official website is obnoxious. (see attached screenshot image of the Cubs.com home page) Look how busy, how utterly distracting the IL Lottery ads are – dominating the background and also within a breakout box within the home page content (where we usually see an ad or two). Honestly, it gives me a headache to look at such clutter.